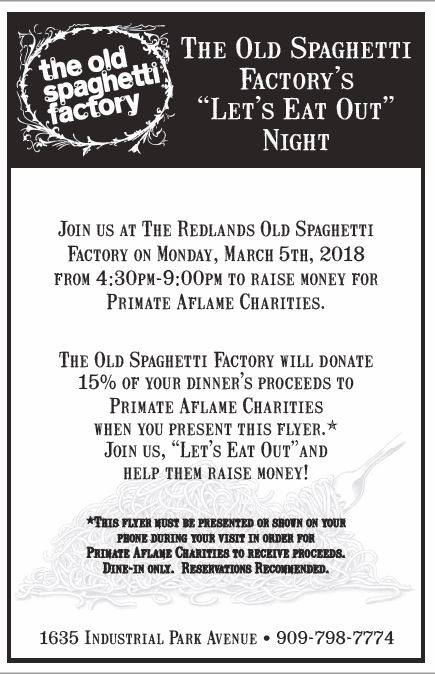 All you need to do is head to the restaurant between 4:30 and 9 p.m. today (March 5), and show them this flier and 15% of your bill will go to support Primate Aflame Charities. Primate Aflame is an organization which raises funds for annual educational scholarships, helps local programs that support media arts, and supports the Leukemia & Lymphoma Society. This entry was posted in Italian, Redlands and tagged fundraisers by John Plessel. Bookmark the permalink.